Michael Faraday demonstrated the first electric transformer. E. W. Tempel discovered asteroid #74 Galatea. William Huggins discovered the chemical composition of nebulae, observating of the spectrum of planetary nebulae NGC 6543, known as the Cat's Eye, using a star-spectroscope. A. Kopff discovered asteroid #640 Brambilla. J. Palisa discovered asteroids #827 Wolfiana and #828 Lindemannia. Sergey Belyavsky and Nikolaj Ivanov discovered asteroids #1118 Hanskya and #1224 Fantasia. The first airship flight around the Earth was completed by the German airship Graf Zeppelin, flying eastward, starting and ending at Lakehurst, New Jersey, USA. NASA's Ranger 1 re-entered the Earth's atmosphere after 111 orbits, instead of going to the Moon, because of an upper stage misfire. NASA Ranger 1, launched 23 August 1961 from the Atlantic Missile Range on an Atlas-Agena B booster, was a test version of the spacecraft which would attempt an unmanned crash landing on the Moon. The 306 kg spacecraft did not attain the scheduled extremely elongated orbit because the Agena B upper stage misfired. Although the spacecraft systems were tested successfully, only part of the eight project experiments could be carried out. Ranger 1 reentered the Earth's atmosphere on 29 August after 111 orbits. Ranger 1's primary mission was to test the performance of those functions and parts that are necessary for carrying out subsequent Lunar and planetary missions using essentially the same spacecraft design. NASA and the USAF launched X-15A Heating Test mission # 69 in which Robert Rushworth reached a maximum speed of 5547 kph (Mach 5.12) and attained a maximum altitude of 29.627 km. Goethe Link Observatory discovered asteroid #2326 Tololo. NASA astronauts Gordon Cooper and Pete Conrad, orbiting Earth aboard Gemini 5, spoke to astronaut Scott Carpenter, who was 205 ft underwater in Sealab II. Gemini 5, carrying astronauts Gordon Cooper and Charles "Pete" Conrad was the third crewed Earth orbiting spacecraft of the Gemini series. Mercury veteran Cooper was the first person to travel on orbital missions twice. The flight was designed to last eight days, the length of time that it would take to fly a mission to the Moon, and to test rendezvous procedures. The major objectives of this mission were to demonstrate a long-duration crewed flight, evaluate the effects of long periods of weightlessness on the crew, and test rendezvous capabilities and maneuvers using a rendezvous evaluation pod. Secondary objectives included demonstration of all phases of guidance and control systems to support rendezvous and controlled reentry guidance, to evaluate the fuel cell power system and rendezvous radar, to test the capability of either pilot to maneuver the spacecraft in orbit to close proximity with another object, and to conduct 17 experiments. Gemini 5 doubled the manned space flight duration record to nearly eight days, thanks to new fuel cells that generated enough electricity to power longer missions. Gemini 5 was launched from Complex 19 at Cape Kennedy, Florida, on 21 August 1965 at 8:59:59 AM EST (13:59:59.518 UT), and inserted into a 162.0 x 350.1 km Earth orbit at 9:05:55. The rendezvous evaluation pod (REP), a 34.5 kg optical and electronic duplicate of the Agena planned for use in later Gemini rendezvous missions was deployed two hours into the flight on the second revolution. About 36 minutes into the evaluation of the rendezvous system, the crew noticed the pressure in the oxygen supply tank of the fuel cell system was dropping. At some point earlier in the flight, the oxygen supply heater element had failed, and the pressure dropped from nominal pressure of 850 psia to a low of 65 psia 4 hours and 22 minutes into the flight. This was still above the 22.2 psia minimum but it was decided to cancel the REP exercise and power the spacecraft down. An analysis was carried out on the ground, and a powering up procedure was started on the seventh revolution. During the remainder of the mission, the flight plan was continuously scheduled in real time, pressure slowly rose in the fuel cells, and sufficient power was available at all times. Four rendezvous radar tests were conducted during the mission, in the first in revolution 14, on the second day, the spacecraft rendezvous radar successfully tracked a transponder on the ground at Cape Kennedy. On the third day, a simulated rendezvous with a phantom Agena was conducted at full electrical load, in which the the Gemini maneuvered to a predetermined position in space. The simulation comprised four maneuvers: apogee adjust, phase adjust, plane change, and coelliptical maneuver, using the orbit attitude and maneuver system (OAMS). On day five, thruster number 7 became inoperative and maneuvering system operation became sluggish. Thruster number 8 failed the next day, and the system became increasingly erratic. Limited experimental and operational activities continued throughout the remainder of the mission. On the last flight day, Cooper and Conrad spoke to astronaut Scott Carpenter, who was 205 feet underwater in Sealab II. Retrofire occurred at 7:27:42 AM EST on 29 August on revolution 120, one revolution early due to a threatening tropical storm near the landing area. The crew had to use the re-entry thrusters to orient the spacecraft because of the OAMS system failures. The retrofire and re-entry were conducted in darkness by the spacecraft computer. Splashdown occurred at 7:55:13 AM EST in the western Atlantic at 29.73 N, 69.75 W after a total mission time of 190:55:14. 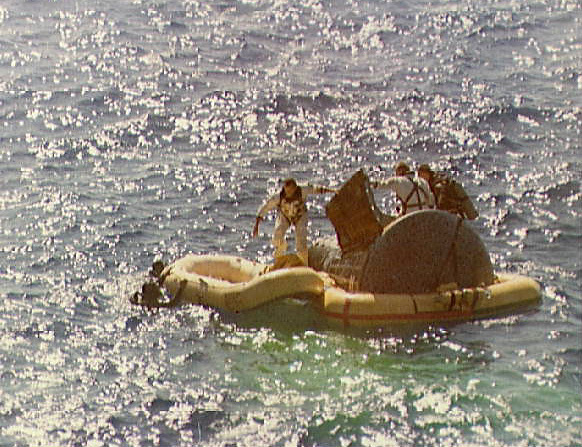 Splashdown was 169 km short of the target due to incorrect navigation coordinates transmitted to the spacecraft computer from the ground network: Someone had entered the rate of the Earth's rotation as 360 degrees per 24 hours instead of 360.98 degrees (sidereal day correction). Cooper's efforts compensated for what he recognized as an erroneous reading and brought the capsule down closer to the ship than they would otherwise have been. The crew arrived onboard the aircraft carrier USS Lake Champlain at 9:26 AM EST and the spacecraft was recovered at 11:50 AM EST. All objectives were achieved except rendezvous with the REP and pilot tests associated with the rendezvous and the demonstration of controlled reentry to a predetermined landing point. Scientific studies included zodiacal light, synoptic terrain, synoptic weather photography, and a cloudtop spectrometer experiment. In addition, five medical and seven technological experiments were performed during the mission. One photography experiment was cancelled because of cancellation of the rendezvous maneuver. The mission demonstrated human ability to adapt to weightlessness over an extended period and then readapt to normal gravity and was considered successful. With this flight, the US finally took the manned spaceflight endurance record from Russia, while demonstrating that the crew could survive in zero gravity for the length of time required for a Lunar mission. However, the astronauts found the mission incredibly boring, with the spacecraft just drifting to conserve fuel most of the time, and was "just about the hardest thing I've ever done" according to a hyperactive Pete Conrad who later lamented that he had not brought along a book. An accident with freeze dried shrimp also resulted in the cabin being filled with little pink subsatellites. The Gemini program was designed as a bridge between the Mercury and Apollo programs, primarily to test equipment and mission procedures in Earth orbit and to train astronauts and ground crews for future Apollo missions. The general objectives of the program included: long duration flights in excess of of the requirements of a Lunar landing mission; rendezvous and docking of two vehicles in Earth orbit; the development of operational proficiency of both flight and ground crews; the conduct of experiments in space; extravehicular operations; active control of reentry flight path to achieve a precise landing point; and onboard orbital navigation. Each Gemini mission carried two astronauts into Earth orbit for periods ranging from 5 hours to 14 days. The program consisted of 10 crewed launches, 2 uncrewed launches, and 7 target vehicles. The Gemini 5 capsule is now on display at the Lyndon B. Johnson Space Center, Houston, Texas. Astronauts Gordon Cooper and Pete Conrad landed in the western Atlantic, having completed 120 Earth orbits in Gemini 5. T. Smirnova discovered asteroid #2002 Euler. A star in Cygnus was observed going nova, briefly becoming the fourth brightest star in the sky, and visible to the naked eye for about a week. P. Wild discovered asteroid #2320. USSR launched Soyuz TM-6 with three cosmonauts aboard (two Soviets, one Afghan) from Baikonur to the Mir space station. USSR launched Soyuz TM-6 on 29 August 1988, which transported to the Mir orbital station a Soviet-Afghan crew comprised of cosmonauts V. A. Lyakhov, V. V. Polyakov and A. A. Momand (Afghanistan) to conduct joint research and experiments with cosmonauts V. G. Titov and M. K. Manarov who were already aboard Mir. Soyuz TM-6 returned from Mir on 21 December 1988 with cosmonauts Titov, Manarov and Chretien aboard. India's IRS-1B landsat was launched commercially by the USSR from Baikonur, an operational remote sensing satellite for natural resources management. Japan's JCSAT 3 with eight transponders for digital TV was launched from Cape Canaveral, Florida, and positioned in geosynchronous orbit at 128 deg E.
Japan's N-Star-A communications satellite was launched from Kourou and positioned in geosynchronous orbit at 132 deg E.
A Molniya booster launched from Plesetsk carried Argentina's Microsat, the Czech Republic's Magion 5, and Russia's Interball Auroral Probe satellites into orbit for studies of the Earth's magnetosphere and for auroral research. The US Los Alamos National Laboratory FORTE (Fast On-orbit Recording of Transient Events) satellite was launched from Vandenburg, California, to study natural and artificial ionosphere radio emissions, for nuclear test ban treaty monitoring technology. Russia launched the unmanned Progress M-48 resupply vessel from Baikonur to the International Space Station. Russia launched Progress M-48 from Baikonur to the International Space Station on 29 August 2003. It docked with the Zvezda module of the ISS on 31 August, and undocked at 08:36 GMT on 28 January 2004 after being filled with trash and unneeded equipment. It was then deorbited and reentered over the Pacific at 13:46 GMT on 28 January. China launched the FSW-19 / FSW-3 2 surveillance satellite from Jiuquan, officially for conducting space scientific research, land surveying, mapping and other scientific experiments. China launched the recoverable FSW-19 / FSW-3 2 military surveillance satellite from Jiuquan on 29 August, 2004, officially for conducting space scientific research, land surveying, mapping and other scientific experiments. The mission is reported to have improved experimental technology, with higher orientation precision and more complex onboard computers and software. It was controlled from the Xian Satellite Monitoring and Control Center, successfully re-entered, and was recovered after 27 days in space at 23:55 GMT on 24 September.